MRO Plus is SPC's number one universal sorbent and comes in several weights and sizes. 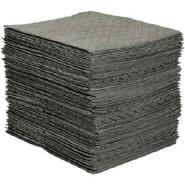 Its 3-ply construction absorbs all industrial liquids, is more durable and reduces lint. Can be used basically anywhere there's a drip, leak or spill including machine, maintenance and liquid storage areas.